If you're wondering what this is all about, you can read the TAST Week 1 post here. This week the challenge is the buttonhole stitch. I managed to both practice it on my "temari sampler" (above) and complete a finished temari using exclusively the buttonhole stitch (below). 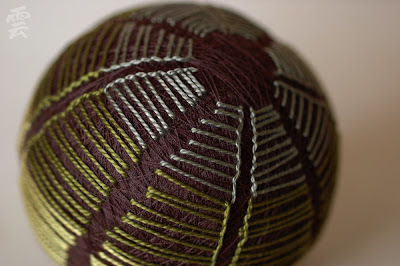 Click here to view the complete post about & see more photos of the finished buttonhole temari, "What I Don't Understand." Below are my first practice stitches, and some variations of stitches that are in the buttonhole family. I like this stitch; again the temari as a canvas presents unique challenges, particularly adjusting the tension of the stitches correctly so as not to pull the threads too much, and obviously I need lots of practice. Fantastic! These tamari samplers are such a unique idea, love it. Beautiful! I too really like your idea of making samplers on tamari (a craft I want to try but never seem to get around too -- want to try too many things, I fear). My fave's the nautilus. Yours is looking better than my meagre attempt, still I am hopeful to improve, and must remind myself that all this embroidery is new to me!